City Space India Pvt. Ltd.
SAFFRON TIGER INFRAVISION GROUP PVT. LTD.
Best Offers Available Across Market !! M3M Group has developed M3M Golf Estate that is combination of low-rise, mid-rise and high-rise towers located in Gurgaon. 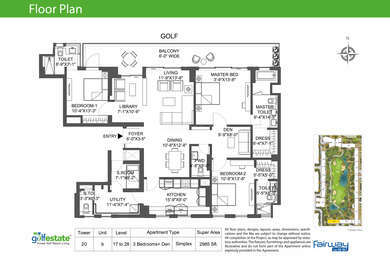 Golf Estate offers spaciously built 3BHK, 4BHK, 5BHK apartments, imperial duplex and triplex penthouses. The floor plans offer various combinations with study room and pooja room to all its residents with separate servant quarters. The property provides a dazzling ambiance and green surroundings to its occupant. 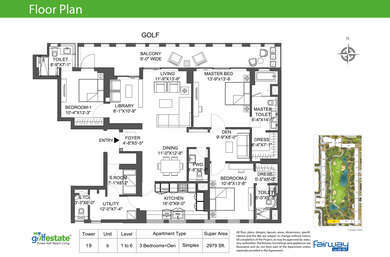 The flats starting from 2nd level upwards offering contiguous views of Golf even while driving or walking. 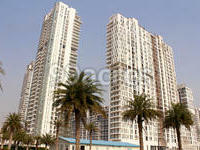 It also provides open land with serene and flamboyant surroundings in Gurgaon. Sector-65, Gurgaon located on the Golf course extension road. The locality is a fast growing locality in Gurgaon that has gained a lot of popularity in recent times among Real Estate developers. In addition to being a peaceful residential neighborhood, it is also growing in terms of commercial and retail opportunities. The major highway that links the place is National Highway 8, the road that runs from Delhi to Mumbai. Having the Golf Course Extension Road passing adjacent to this sector, it is very well connected by roadways. There are many reputed schools, colleges, and universities in the vicinity. The sector also offers diverse options for leisure and entertainment activities for the residents to enjoy and relax. Where is M3M Golf Estate located? Sector-65, a prime residential locality for house seekers in Gurgaon. 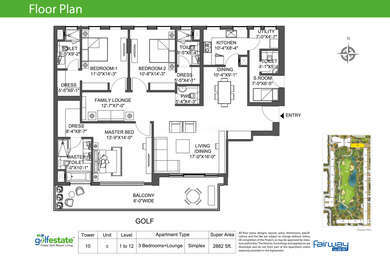 What is the area of apartments in M3M Golf Estate? The area of apartments offered in the project ranges from 2850.0 sqft to 11635.0 sqft. What is the 4 bedroom size in M3M Golf Estate? Four-room units (4BHK) in the project are available in an area of 4096.0 sqft to 11635.0 sqft. How much is the total size of M3M Golf Estate?The project is spread over an area of 75.0 Acres. How much is price of 3bhk in M3M Golf Estate? The price of 3 BHK units in the project ranges from Rs. 25932236 to Rs. 54533000. CCTV for basements, ground floor lobbies, lift cars, entry and exit. clude names like M3M Golf Estate, M3M Merlin, M3M Polo Suits. Little more than a decade into the real estate business, the organization keeps up to its motto to the fullest. It keeps exhibiting innovativeness in every project that it undertakes and of course keeping in mind a cosmopolitan outlook, each and every project has been highly inspired from foreign locales. I am looking to buy a 5 BHK in M3M Golf Estate. What are the ongoing prices in this society? What all means of transportation are available in sector-65, Gurgaon? Hi Vartika! 5 BHK in M3M Golf Estate is available with a super-built up area varying between 5500 sq ft to 5900 sq ft.  Both resale and new booking property is available in this category. The price ranges between Rs 4 Crore to Rs 9 Crore depending on whether it is a resale or new booking property. This society is in proximity to Golf Course Extension road thereby providing easy connectivity to Delhi. Sector 55-56 Rapid Metro station is 12 minutes away. Splendor Tower and Xaviers High School bus stops are just 7-8 minutes from this society. In addition, cabs and auto rickshaws are also easily available in this area. Is M3M Golf Estate a ready to move in project? What all security measures have been undertaken to ensure the safety of the residents? Hi Mehak! Phase 1 of M3M Golf Estate is ready to move whereas Phase 2 is anticipated to be ready for possession in the next three months. It is a gated society with 3 tier security, i.e. security guards stationed at the main gate and the entrance lobby of each tower; CCTV cameras are installed at all the appropriate spots to ensure no activity goes unnoticed in the premises and Firefighting systems are also installed so that the staff is fully equipped to deal with any unforeseen situation. In addition, the provision of video door security is also there. Hi Mehak, How r u there.Yes m3m golf estate is ready to move. there are two part of this project. one is fairway east and another is fairway west, in both part right now fairway west is ready to move as fairway east is under development now and will ready in 5-6 month's. Currently security is very good as respond from the residents in fairway west m3m gold estate. there is 3 tier security including cctv surveillance. But in late night be careful when you move to outside of society.